66 Annual Camp Essentials to get your Summer Training off to a great start! With British summertime in full swing Cadets from all over eagerly await annual camp. With this in mind we have created a really helpful kit list so that you can make sure you have everything packed from the flint to the 1000 mile socks. When the cadet summer training starts you’ll want to have the right gear for the job. 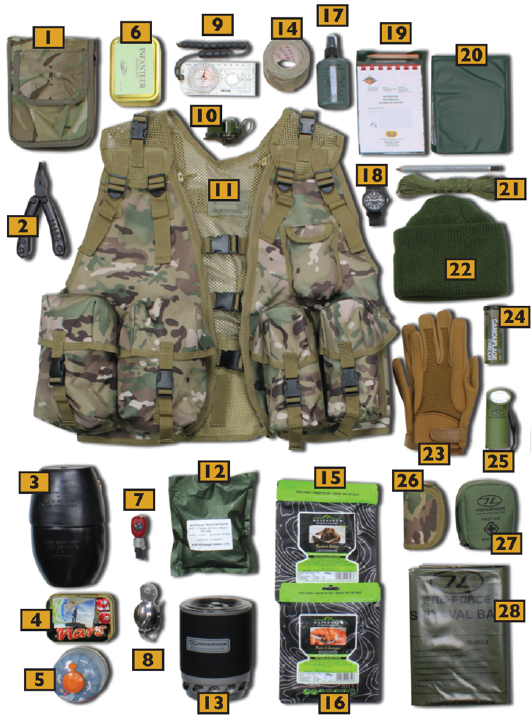 Let’s start with the image below and work our way through the cadet kit list. 1) A6 Orders Book Cover, MTP : BC16MC – Great for transporting maps, order books, and various documents. 2) Harrier Multi-Tool, Black Oxide: MUL005 – Offers rubber inlay for comfort when carrying plus 8 useful tools. 3) 58 Waterbottle & Mug: AB17 – 1958 NATO-approved British Forces water bottle. Constructed from thick plastic. 4) Survival tin: SUR018 – Features silicone seal to keep your survival kit protected. Use alternatively as a cooking pot. 5) Cooking Fuel/Gas: JETPWR-230 – High-performance propane & isobutane all season blend gas canisters. 6) Infanteer Model Making Kit: VAN120 – Add clarity to briefings with this combination of weatherproof visibility labels including Coy HQ, RV, FUP, Enemy, Plt, Sect and Fire Team markers. 7) Mini Fireball Flint Striker: CN340M – Easy to use, designed to burn hotter for longer and even has built in emergency compass. 8) Sporknife (Compact KFS): TU201 – Lightweight utensil including folding fork, spoon and knife with a serrated edge. 9) Compass: AN11 – Manufacturers lifetime guarantee. Not only a great compass, but one that features a magnifying glass, ruler, direction arrow, lanyard and orienteering lines. 10) Whistle: TR11 – Add to your survival kit or use during expeditions. 11) Cadet Assault Vest, HMTC: TT620HMTC – Designed by UK Cadet Forces Personnel. Fully adjustable. 12) Emergency Sweets Ration: MM108F – 200g of glucose fruit sweets. Stored in a vacuum sealed pack for safe keeping. 13) Blade Fast Boil Stove: CP219 – Boil water on camp in under 3 minutes, heat your boil in the bag and keep your food and drinks warm with the thermal container included. 14) Sniper Tape MTP: ST10TAN – 10 metres of genuine issue sniper tape that will fit in your pocket! Useful for fixing equipment, covering weapons and patching tents. 15) Sausage & Beans Meal: WAY654 – Provides a substantial meal and satisfies the largest of appetites. 16) Chocolate Pudding Meal: WAY648 – Everyone loves chocolate pudding! Especially sitting round the camp fire after a long day of expeditions. 17) Insect Repellent: RC7727 – Repels ticks, mosquitoes, flies, midges and fleas. 18) Military Wrist Watch: T49713 – Comes with manufacturers 2 year guarantee. Can be submerged in water up to 100m. 19) Waterproof Notebook: MA065 – No matter the weather, get your briefing notes down. 20) Nyrex Orders Book: AC44CP – 20 clear plastic sleeves enable you to organise your orders when on camp. 21) Paracord / Comms Cord: AB11CP – Versatile cord can be used for basha building, as emergency boot laces and even for fishing and sewing. 22) Benny Hat: AB5454 – Warm yet breathable benny hat, great when doing fieldcraft outdoors after the temperature has dropped. 23) Rapdom Neoprene Gloves: GT28BLK – Good palm protection, lightweight and easily packed into webbing or a jacket. A great all round pair. 24) Wesco Camo Cream Stick: AB09ARTCP – Moisturises the skin, offers high sun protection and is easy to camouflage yourself. 25) Kadar Red Torch: TOR026 – Offers 4 different colour settings perfect for fieldcraft, general use and emergency use. 26) Pro-Force Sewing Kit: TA024HMTC – Safely organises needles, safety pins, needle threader, thimble, scissors and various buttons. 27) Highlander First Aid Pack: FA116 – Great lightweight kit made for treating minor injuries. 28) Pro-Force Survival Bag: CS037M – Emergency shelter to provide protection from the elements. 29) Challenger 150 Sleeping Bag: SB067 – High performance insulation, wind resistant and reinforced lined foot box. 30) Bungees, Pair: AB10 – Made from 6mm elastic and offering two strong metal hooks these bungees are great for a variety of camp tasks. 31) Highlander Elite Sleep Mat: SM012 – Waterproof, insulated and warm 3 season military camping mat. 32) Pro-Force Basha, HMTC: MA100HMTC – Supplied in a drawstring stuff sack for easy transportation. Build a robust shelter on your summer camp. 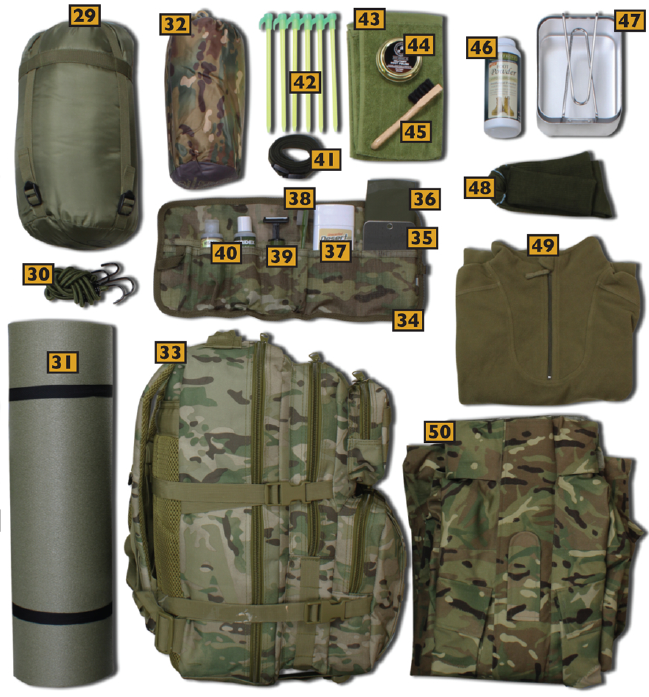 33) Medium Assault Pack: KT005 – Modern MTP assault pack made for patrols, marching and fieldcraft exercises. Features an internal hydration sleeve for water bladders. 34) Web-tex Utility Wash Roll: WT70MC – Keep yourself clean on camp with this compete wash roll which includes a toothbrush, toothpaste, body wash, shaving cream, razor and mirror. 35) Field Mirror: TR12 – Great for helping you to apply camouflage cream. 36) Bowl: AB56 – Perfect for summer camp this thick plastic bowl is available in tactical military olive green. 37) Desert Dry Military Deodorant: RC8276 – Odour protection formula that lasts all day and leaves no white residue on your uniform. 38) Folding Toothbrush: CS740 – Small, lightweight and in tactical olive green. Perfect your dental hygiene when on summer training. 39) BCB Twist Razor: CS613 – Fits into a compact camouflaged handle, ideal additional for your field wash kit. 40) Steridex/Pits & Bits Wash: CL450 – Great for sterilising your hands before preparing food, especially when water and soap are in short supply. 41) Utility Straps, Pair: RL19CPM – Make your packing a little tighter with these utility straps. Reduce the rattle and thread webbing pouches with ease. 42) Fluorescent Tent Pegs: CS073 – Glow in the dark pegs mean you won’t go loosing any when packing up in the dark. 43) Military Towel: MA108 – This 100% cotton military towel is ideal for camp. 44) Wax Shoe Polish: AB10309 – Protects and cleans leather boots, buff to gain a high shine finish. 45) Dasco Applicator Brush: DUN5721 – Effective in removing dirt and applying polish to boots, especially in the hard to reach area like the welt. 46) Military Foot Powder: AB8261 – Absorbs moisture, reduces friction in the boot and reduces possible infection and bad odour. 47) Mess Tins: AB21 – Two in a pack, use them for eating from and for boiling water. 48) 1000 Mile Socks, 1 Pair: UW03195CP – With long distance walking in mind these cutting-edge socks will reduce the possibility of blisters, stay gripped to your heel and provide a wooly warmth. 49) PCS Thermal Fleece: BL102-0L – Stay warm on camp with a thermal fleece. 50) MTP Waterproof Jacket: WJ005HMTC – Stay dry on camp with a waterproof jacket. Comes with a concealed hood, several velcro zippered pockets and in a variety of sizes. 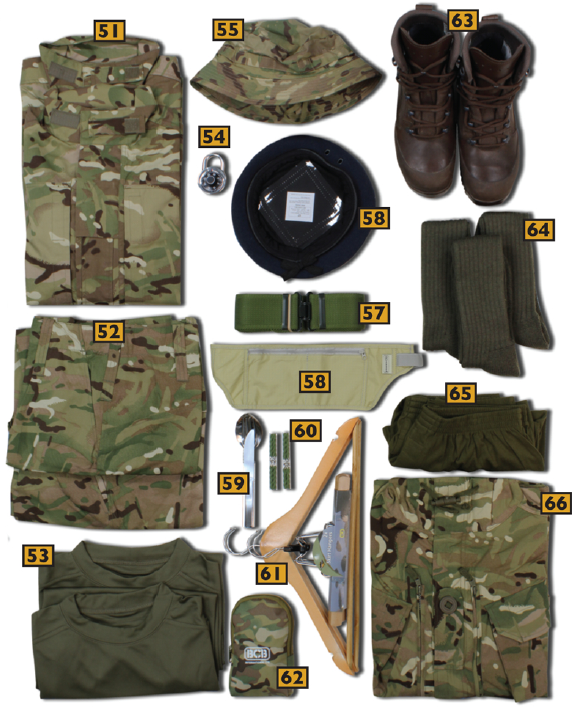 51) PCS Combat Shirt: MTP11G – Issued British Forces combat shirt includes lots of pockets for maps and kit. Available in lots of different sizes! 52) PCS Combat Trousers: SP-PCS-PT-33 – Proper British Forces lightweight combat trousers made from polycotton. 53) T-Shirt Combat: AA15 – 100% cotton base layer available in a variety of sizes. 54) Combination Padlock: CL10016 -Set a combination and store your valuables with this Ultra Force Combination Padlock. 55) Multi-Terrain Bush Hat: AB04MC – This Special Forces Bush Hat is produced from genuine Multicam fabric and offers protection from the elements plus a bit of extra camouflage. 56) Genuine Issue Beret – Features a leather band, 100% cotton lining, shaping instructions and NATO stock number. 57) S’95 Working Dress Belt: AA22 – Popular for those wearing PCS uniform as well as Air Cadet Greens. 58) Highlander Money Belt: MB101 – Made from ripstop polycotton with a mesh underside. This lightweight money belt will help you keep your passport and cash safe on annual camp. 59) KFS Set: AA27 – Stainless steel knife, fork and spoon set ideal when away from home. 60) Trouser Twisters: AA24 – Secure the bottoms of your trousers with these elasticated trouser twisters. 61) Coat/Skirt Hangers: HG009 – Hang your uniform to keep it in pristine condition while you are away on annual camp. 62) BCB Boot Cleaning Kit: BC006M – Get yourself a cleaning kit to keep your boots looking on point during camp. In the pouch you will receive 2 brushes, 1 tin of Leder Gris, replacement laces and a cloth. 63) Combat Boots: AB14CP – The Elite boots are high performance boots at an affordable price. 64) Cadet Patrol Socks: MS0CADCP – Reinforced heel and toe, wool-rich and warm construction patrol socks. 65) Boxer Shorts: MT11201001 – Grab yourself a few pairs of 100% single jersey 140-145g cotton rich, elasticated military boxers. 66) PCS Combat Smock: KU-PCS-PT-33 – Specially designed to serve the uniform requirements of soldiers, reservists and cadets. Where are you heading on your cadet summer camp?